Hi! How have you been? Quite well, I hope. Thanks for all of the randoms you’ve been sending my way: the random text messages, random concerns, random pictures of random brown dudes chillin’ with their probably-also- concerned random family members. Thanks! But my dad is still not convinced I have the whole “act like a lady” thing down pat. So I’m going to spend the next several (and by several, I mean “around ninety”) years perfecting that, drinking Jameson, being an ordained minister, playing the drums, going to shows and stalking Glen Hansard, blogging about my frustrations and the baked goods that come out of them, and not committing myself to random dudes. P.S. Do you like apples? Well I made apple muffins. How d’ya like them apples? Why doesn't anyone ever text me pictures of this guy and tell me I should marry him? 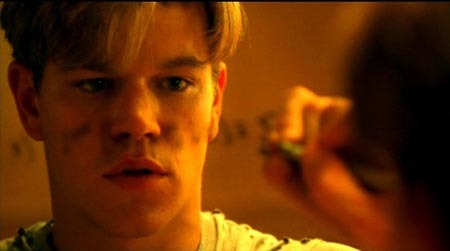 Yes, I did have to throw a thinly-veiled Good Will Hunting reference in there, because a. I made apple muffins and b. that is a damn good piece of film. So anyway, it appears that the matchmakers of my family have struck again. And no, to the shock of everyone involved, it was not my mom who conceived of this particular dastardly plan to try to get me hitched. In fact, she was the one who called the evil genius individual who dared send me images of a mystery suitor, to set him straight and basically scare the crap out of him. I’m not going to dwell on this one too much, mostly because I’m not that mad and it’s kind of hilarious to imagine my mom yelling at anyone who isn’t me. Love you Mama. Thanks for sticking up for me! Let’s talk good news: Saturday I ran the Susan G. Komen Race for the Cure, which is a 5K race. Oh, and I actually ran the whole thing. Yes, I can hear you saying “Um, duh, moron, that’s what you’re supposed to do,” which is warranted I suppose. But I was a kid who spent far too many days and nights, including one Christmas, laying in a hospital bed with a stupid nebulizer strapped to my small and adorable face (yes it really was both of those things, hush now), so I’m sorta proud of myself. I’ve since decided to train to become a competitive runner, and my next mission is to complete a triathlon. That is not true, and will likely never be true. I’m going to leave the hard stuff like triathlons to rock stars like my best friend Melinda. She’s a triathlete with two races under her belt! 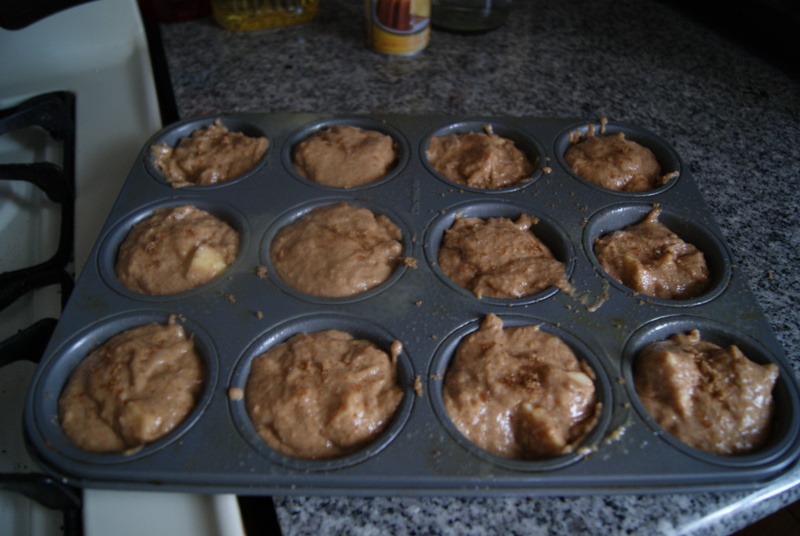 But I did feel a tiny bit healthier post-run, which led me to try to up the good-for-you factor of these Apple Muffins. Yes, I did borrow from Martha, but I kind of only used her recipe as a guideline and changed pretty much everything about it. I also used more apples because my dad dropped by my apartment and for some reason brought a 3-pound bag of Galas with him. Thanks, pops! So I’d heard from various sources that applesauce can work as a stand-in for butter, but only in small doses. I’ve been experimenting in my lab for weeks now, and decided it was time to really commit to trying this. 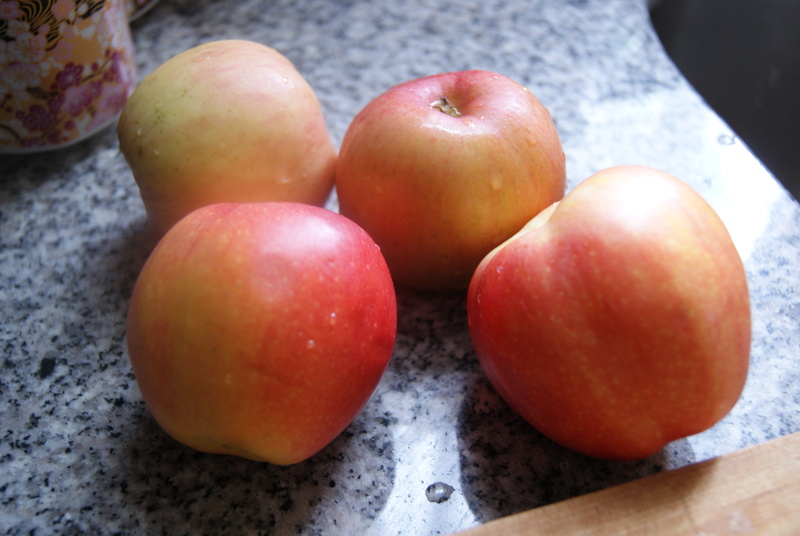 What better recipe than one already involving apples, right? And anyway, the sauce cuts down on the fat and cholesterol contents, so yay! Preheat the oven to 400°F. Grease a 12-cup muffin pan with nonstick spray. In a large bowl, combine the flour, sugar, salt, cinnamon and baking soda. Sift together, then toss the apples in this mixture. In a separate bowl, whisk together your egg, egg white, buttermilk, butter and applesauce. Pour wet mixture into dry mixture and combine just until completely mixed. Don’t go crazy now– if you mix too much you’ll basically beat the air out of the batter and your muffins will come out heavy and lumpy. And then I will laugh at you. Spoon the batter evenly into your muffin pan, and sprinkle the tops with a bit of brown sugar if you please (I myself did please). Toss into the oven for 16 to 18 minutes, until the tops look browned. Let them cool for a few minutes in the pan before turning them out onto a plate to cool completely. Then go crazy and eat like five of them. That’s totally healthy. I decided not to take yet another photo of me holding up the baked good in question, mostly because I am starting to get a little self-conscious about my wonky thumb. I’ll tell you all about it later. Maybe that story will ward off all of these weirdos the family’s been trying to set me up with. 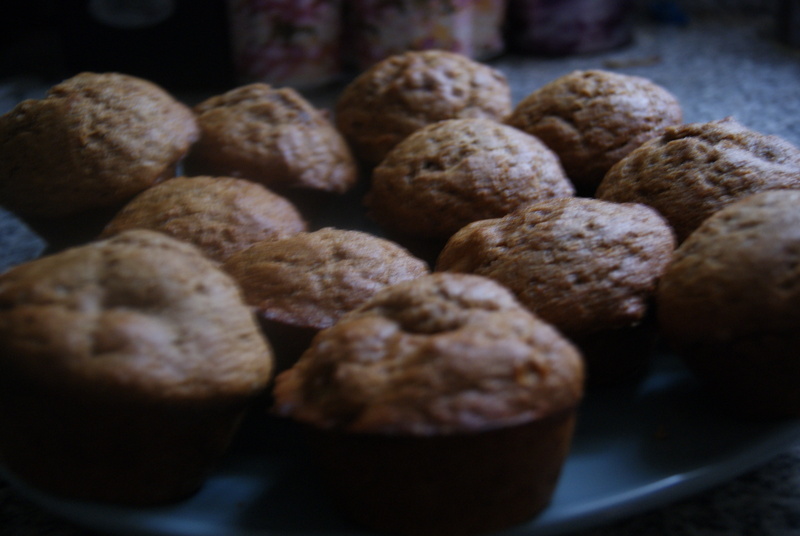 Anyhoo, I’m pleasantly surprised by these muffins. They’re not overly sweet, but they’re also soft and pillow-y, especially when warm. With a low fat and high fiber content mixture, I don’t really feel too badly about eating them. But I never really feel too badly about eating anything, so I guess I’m not an accurate litmus test. Let’s just leave it at this: they’re yummy, they’re not at all bad for you, even my parents liked them, and no I am not marrying your random friend/cousin/cousin’s friend. Bye! ← I Make A Pretty Mean Cookie Bar. Oh, Also, I AM THE WORST. Yeah so I heard that you’re meeting Laura for lunch next week. Perhaps you could hand her a bag of these when you do….. 🙂 Btw, AWESOME job running the Komen race! I get tired just thinking of that. Thanks for the Komen love cuz! Much appreciated. thanks for the shout out. by the way good job “running” the whole thing!